An attractive, individually extended, well presented and appointed, gas centrally heated, sealed unit double glazed, three bedroomed, detached bungalow with spacious, flexibly arrangeable accommodation including a split-level reception hall, a well proportioned loungedining room, fitted breakfast kitchen, three good bedrooms (one currently used as a study), family bathroom with four-piece white suite, an attached single garage with adjoining laundryutility room, additional off-road parking and lovely gardens to three sides, all at the heart of this sought-after east Leicestershire village. EPC D. NO UPWARD CHAIN. General Description: - Situated all at the heart of this sought-after village, this attractive, detached bungalow has been extended to offer spacious accommodation briefly comprising a split-level reception hall, loungedining room, breakfast kitchen, three bedrooms (one currently used as a study) and bathroom with four-piece white suite. The property sits on a slightly elevated plot and benefits from delightful gardens to three sides, together with off-road parking and an attached single garage with adjoining laundryutility room. Bedroom 3 Or Study - 13'7 x 11'0 (4.14m x 3.35m) - With central heating radiator, sealed unit double glazed side and rear picture windows, telephone point, built-in shelved wall unit with two double cupboards under, ceiling light fitting and sealed unit double glazed French door to rear garden. Breakfast Kitchen - 14'0 x 11'6 max. (4.27m x 3.51m max.) - With units and equipment including single bowl stainless steel sink and drainer unit with hot and cold mixer tap inset to L-shaped tiled worktop with range of drawers and cupboards under, sealed unit double glazed side picture window with blind over and integrated appliances including 'John Lewis' refrigerator and matching dishwasher, together with split-level cooker comprising 'Beaumatic' oven with 'Bosch' four-plate gas hob and cooker hood integral to two wall cupboards over. Also with vinyl floor covering, central heating radiator, sealed unit double glazed side picture window with blind, tiled splashbacks to working surfaces, recessed ceiling spotlighting, built-in shelved storage cupboard and built-in dresser style unit comprising tiled worktop with matching splashback having range of drawers and cupboards under, shelved tall-boy cupboard adjacent and range of part glazed matching wall cupboards over. Side Lobby - With UPVC framed and panelled part sealed unit double obscure glazed external door to front, built-in double coat cupboard and part glazed door to garage to rear. Bedroom 1 (Rear) - 14'2 x 10'8 (4.32m x 3.25m) - With sealed unit double glazed rear picture window, central heating radiator, TV and telephone points, coved ceiling with light fitting and range of furniture comprising two double and single hanging and shelved wardrobes with matching over cupboards, additional single shelved wardrobe with matching over cupboard and adjoining bedside table with two drawers. Bedroom 2 (Front) - 9'9 x 8'8 max. (2.97m x 2.64m max.) - With sealed unit double glazed windows to front and side aspects, central heating radiator, ceiling light fitting and built-in triple hanging and shelved wardrobe. Fully Tiled Bathroom - With four-piece white suite comprising panelled bath with hot and cold mixer tap, wash hand basin inset into vanitory unit with double cupboard below, adjoining low flush w.c. with worktop over and fully tiled shower enclosure with wall-mounted shower unit incorporating flexi hose to sliding track, together with wall-mounted shower seat and glazed folding shower doors. Also with tiled floor, upright heated towel railradiator, recessed ceiling spotlighting and sealed unit double obscure glazed side window with blind. Attic Room - From the entrance hall, folding ladder gives access to a large substantially boarded attic area with existing sealed unit double glazed window. 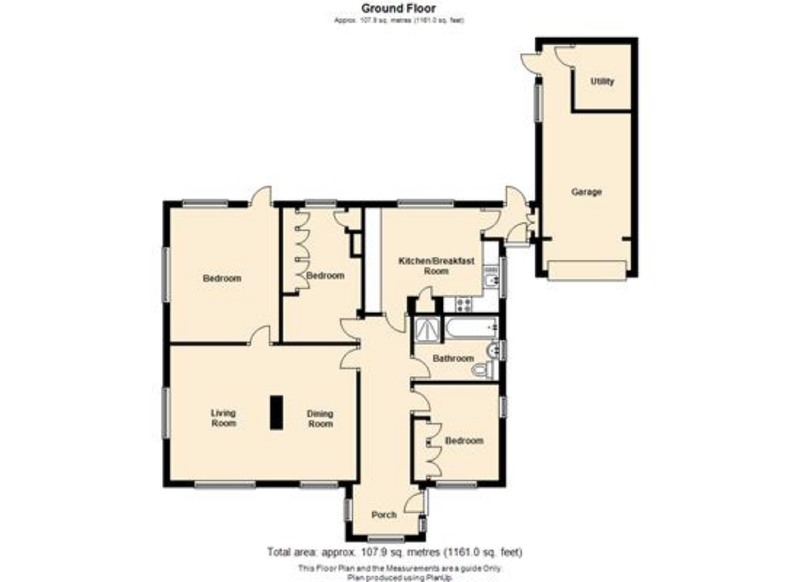 This room is currently used for storage purposes but would make an ideal hobbies room, or could easily be converted/adapted into additional bedroom accommodation subject to the usual consent. Utility Room - 9'5 x 6'5 (2.87m x 1.96m) - With vinyl floor covering, range of wall cupboards, strip lighting and shelved tall-boy cupboard. Side Garden - The side garden features a lawned area with inset fish pond and particularly well stocked borders of specimen shrubs and bushes, together with a fenced side boundary. Rear Gardens - The rear garden enjoys an extensive, split-level, flagged patio with intervening raised shrubbed border, a garden shed and fenced surrounds for privacy. Services: - All mains services are understood to be available. Central heating is gas fired and ample electric power points are fitted throughout the property which is double glazed with sealed units and benefits from a security alarm system. The Vendor(s) of this property has (have) completed a Property Information Questionnaire which provides prospective purchasers with important information about the property which you may wish to consider before viewing or making an offer. Please enquire with the relevant office if you would like to view a copy. Directions - Proceed out of Leicester in an easterly direction along the A47 HumberstoneUppingham Road, continuing through Humberstone, Thurnby and Bushby, towards Uppingham. Upon entering Houghton-on-the-Hill on the A47, take the second right into Main Street and then the second right into Scotland Lane, where the property can be found on the right hand side of the road, as identified by the agents 'for sale' board.